Wesbeam is a leading manufacturer of engineered renewable plantation softwood structural timber products used in roofs, walls and ﬂoors in home building and in formwork and scaffolding in the commercial construction industry. Its $100 million state-of-the-art plant employs 130 people and its products are distributed to building sites all over Australia. In mid-2009, Wesbeam decided to review and upgrade its ofﬁce and administration IT infrastructure and move to a virtual environment. As Wesbeam is a 24/7 operation that relies heavily on its information systems, ensuring business continuity was critical. Stott Hoare Solution Architects were able to design and implement an end-to-end solution that encompassed new servers, storage and backup systems and all associated infrastructure and software. The solution fulﬁlled Wesbeam’s next three to ﬁve year requirements for greater efﬁciency and better performance and also provided scalability for future growth. Importantly, Stott Hoare was able provide Wesbeam with the reassurance of IBM servers, storage array, tape backup and backup server at a lower cost than a competitive brand with a less well-established record of reliability and durability. “Wesbeam’s legacy system was IBM-based, but some components, such as servers, were approaching the end of their useful lives,” said John Gagel, Stott Hoare Solution Architect. "Stott Hoare is keenly aware that cost-effectiveness is a critical factor for any business making a decision about a new IT solution, so our initial challenge was to carefully examine what existing equipment could be utilised. However, we had to design a vastly superior system that provided signiﬁcantly better performance and backup capacity and migrated storage to a network environment. "Although Wesbeam was comfortable with IBM on the basis of its legacy system, they also obtained a competitive proposal utilising Dell equipment with an expectation this would reduce their initial investment. Stott Hoare was ultimately successful in providing a totally IBM solution at a more competitive cost. Equally attractive to Wesbeam was our capacity to provide an end-to-end solution from design to hardware and software supply and installation," said John. “Business continuity is a critical factor for Wesbeam, so this project is actually stage one of a two stage process. The aim was to upgrade to the latest technology with fewer servers and a virtual environment as the ﬁrst part of a more exhaustive backup and disaster recovery strategy,” said David Gibson, Wesbeam Information Systems Manager. At the heart of Stott Hoare’s solution for Wesbeam are three IBM x3650 servers with Intel Xeon 4C processors and IBM Dual Rank Chipkill memory for enhanced speed, reliability and performance with lower power use. 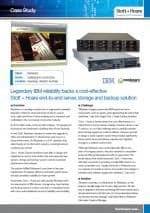 “The IBM xSeries offer leading capabilities in an industry-standard server,” said John Gagel. They are easily scalable, with a ‘building block’ approach to expansion. To help ensure business continuity, they were fitted with redundant power supplies and a central uninterruptible power supply (UPS). It was also critical for Wesbeam to introduce a Storage Area Network (SAN) environment. An IBM DS3400-controlled storage array provides 5 terabytes capacity with fibre optic cabling, with VMware virtualisation solutions utilised including vSphere and vCenter Server. VMware vSphere offers high application availability and responsiveness with the lowest total cost per application workload, while vCentre simplifies and automates virtualisation management to increase IT productivity and create a flexible infrastructure. An IBM TS2900 Tape Autoloader provides fast, fuss-free tapebackup and there’s an IBM x3350 backup server system. Stott Hoare also provided all support infrastructure and racks, cabling and UPS – and implementation and installation services. “Wesbeam is successful, innovative, and really sees the value of aligning its IT infrastructure and capabilities with its business objectives,” said John. “Stott Hoare’s ability to help achieve that critical alignment is one of our great strengths. “Together with our capability to design, supply and install end-to-end solutions – and support them through their working lives and growth – Stott Hoare really can deliver total IT solutions,” concluded John. David Gibson outlined the reasons Stott Hoare was successful. “I was aware of Stott Hoare, and had a good relationship. However, the competitive tenders were very much like-for-like. What swayed the choice were two factors. Firstly, that Stott Hoare was local, and we could deal with them face-to-face. “The second critical factor was cost. Stott Hoare’s quote was only a little lower, but they provided a lower total cost of ownership through a combination of attractive IBM financing and by reducing our ongoing energy costs. “Stott Hoare worked really hard to provide a solution that met Wesbeam’s needs at the best possible cost. “What’s fantastic is that our relationship with them has continued. They offer excellent service backup – although I’d hasten to add we haven’t needed it as yet – but what’s more, they’ve kept in touch post-installation and made sure we’re happy,” concluded David. If you’d like to discuss how Stott Hoare can provide a cost-effective end-to-end solution for your IT requirements – large or small – please contact us on (08) 9244 0000.